Pace Lap Pace lap, Steve Paulauskis on pole leads 29 karts, Kirk Schenck will start late with a battery cable problem. Lap 1 Start lap, good line up, the flag man holds the pack for a few seconds. Karts fan out six wide but everybody makes the first turn and lap. Don Lee leads first lap. Lap 2 Jeff Catlin leads, Samantha Vesperman drops out with engine troubles, William Pfeifer pits with a flat tire. Lap 3 Paulauskis leads, Schenck joins race. Lap 4 Paulauskis still leads, a group of 5 karts starts to separate from the pack. Lap 5 Paulauskis maintains lead, Don Lees engine seizes for the first time, he restarts and continues. Lap 6 Darren Young spins and cannot get restarted, William Pfeifer rejoins race. Lap 7 Bill Pyles catches lead pack, Paulauskis still leads. It was a hot day for October. Not so hot that you saw heat waves coming off the pavement but hot enough that you wanted to sit in the shade with a cool drink and watch other people do the work. It was the kind of hot that would sneak up on you if you forgot your hat. Burn the tips of your ears and the back of your neck. It was just the kind of day that makes you want to get an early start so you can be done by mid-afternoon and then go home, get cleaned up and maybe take your family out to dinner. Go to a nice Mexican food place and relax. Talk about the days events over chips and salsa. Talk about how hot it was, and when it’s going to cool off. About how great it was to have people do all that work that goes into putting on the things you did today. You know, a perfect day to be at the races. Jeff looked across the infield and saw Rich standing by the grid looking back at him. 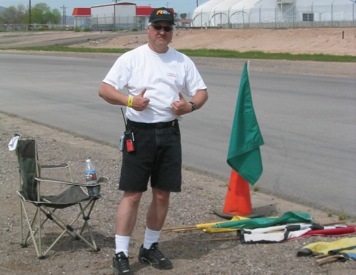 He raised the rolled green flag over his head and twirled it around in a little circle. Rich waved back and turned to the karters sitting on the grid, “Fire ‘em up!” he said. Buttons were pressed and karts were pushed. The engines were coaxed into life, some smoking, some quietly muttering. Rich held his breath so he wouldn’t breath the acrid smoke and waited for the last of the engines to start. When it finally did, he waved the machines onto the track. The noise engulfed him and he grimaced as they went by. Then it was quite. The noise wouldn’t be back for just over a minute. Rich looked at Jeff as he waved the flag to start the race. It’s an odd beginning, but the kart racing group speeding around the track at ASA ProAutoSports events got started at a boat show. 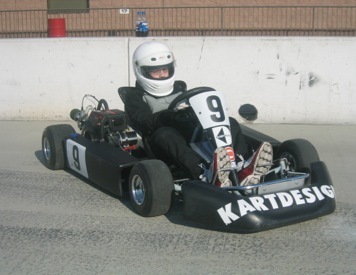 One of the founders of Southwest Karters, Randy Quismorio, was leisurely walking the boat show in Denver years ago when from out of the blue came an offer from a kart construction company showing its wares. Come out to the track. Drive a kart. No charge. Bargain shopper Randy hesitated briefly, but thought what the heck and showed up for his free lesson. Love that long track! It took a little getting used to. Sorry about the race line up, at least we got to do it twice. 37 entries with quite a few new faces.Here is the finishing order for the race.That’s the results for the race. The points will require the use of the old ouija board. Next race for us in Sandia Motorsports Park. August 10th, 11th and 12th. The record high for August 12 is 97 set in 1993The average high for both August 11 and 12 is 90.Not as bad as I thought!From Phoenix it’s 454 miles and about 6.5 hours driving. There is an event up at Miller Motorsport Park in northern Utah. They run with a car club like we do – but we’re all better looking.